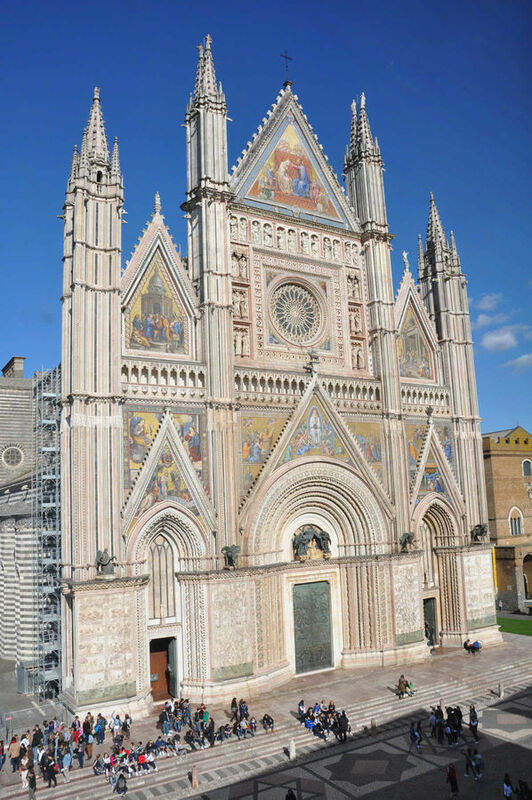 Orvieto is one of the most striking, memorable, and enjoyable hill towns in central Italy. Less than 90 minutes from Rome, Orvieto sits majestically high above the valley floor atop a big chunk of tufo volcanic stone, overlooking cypress-dotted Umbrian plains. A visit here will reward you with a delightful, perfectly preserved, and virtually traffic-free world highlighted by a colorful-inside-and-out cathedral and some of Italy's best wine. Orvieto has two distinct parts: the old-town hilltop and the dull new town below. All travelers start at the bottom, where train passengers disembark and drivers can leave their cars for free. Visitors can then drive or take an elevator or escalator to the medieval upper town. But my preferred mode is joining the locals to climb the town's natural fortress hill on the slick funicular, which deposits riders about a 10-minute walk from the heart of town. Orvieto's cathedral gets my vote for Italy's liveliest facade. This colorful, prickly Gothic facade, divided by four pillars, has been compared to a medieval altarpiece — a gleaming mass of mosaics, stained glass, and sculpture. It's a circa 1330 class in world history, back when no one dared question "intelligent design." Things start with Creation and end with the Last Judgment. Inside, the nave feels spacious and less cluttered than those in most Italian churches. It used to be filled with statues and fancy chapels until 1877, when the people decided they wanted to "un-Baroque" their church. The nave is also an optical illusion; the architect designed it to be wider at the back and narrower at the altar, making it appear longer than it is. Windows of thin sliced alabaster bathe the interior in a soft light. The cathedral's highlight is the Chapel of San Brizio, featuring Luca Signorelli's brilliantly lit frescoes of the Day of Judgment and Life after Death. Although the frescoes refer to themes of resurrection and salvation, they also reflect the turbulent political and religious atmosphere of Italy in the late 1400s. Signorelli's ability to tell stories through human actions and gestures, rather than symbols, inspired his younger contemporary, Michelangelo, who meticulously studied Signorelli's work. Behind the Duomo, a complex of medieval palaces called Palazzi Papali shows off the city's best devotional art. Not to be missed is the marble Mary and Child, who sit beneath a bronze canopy, attended by exquisite angels. This proto-Renaissance ensemble, dating from around 1300, once filled the niche in the center of the cathedral's facade (where a replica sits today). Orvieto also boasts a rich underground world. 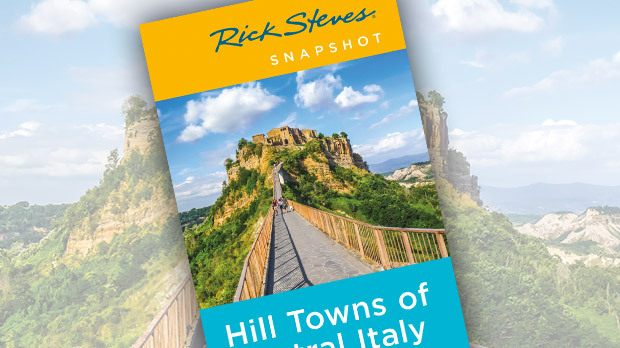 The town sits atop a vast underground network of Etruscan-era caves, wells, and tunnels. Guided tours of the medieval caves offer a glimpse into how these ancient Italians lived, from the remains of an old olive press to a pigeon coop where the birds were reared for roasting. Even now, you'll still see pigeon (piccione) dishes featured on many Orvieto menus. St. Patrick's Well — 175 feet deep, 45 feet wide, and 496 steps down — impresses modern engineers to this day. 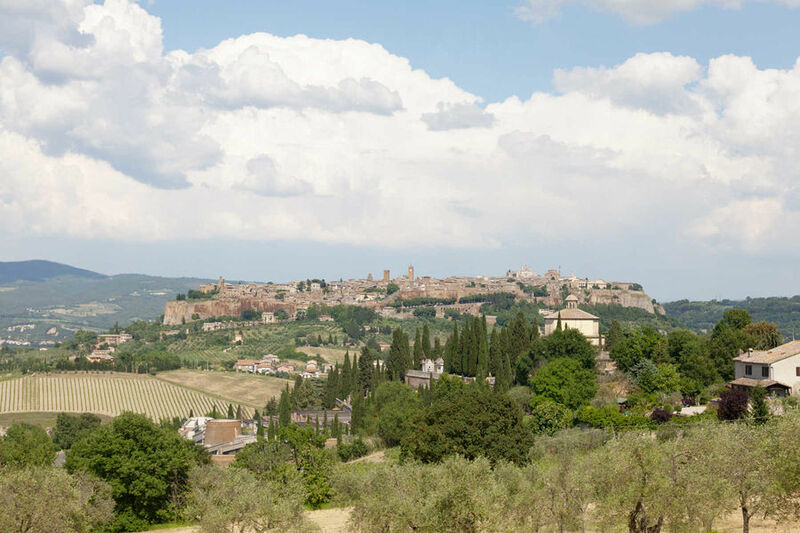 Thanks to its natural hilltop fortification, Orvieto served as a 16th-century place of refuge for the pope. Wanting to ensure he had water during a time of siege, he built this extravagant well, with two spiral stairways leading down to a bridge from which people could scoop up water. The double-helix design was crucial for allowing efficient traffic flow (imagine if donkeys and people, balancing jugs of water, had to go up and down the same stairway). Digging this was a huge project. Even today, when faced with a difficult task, Italians say, "It's like digging St. Patrick's Well."